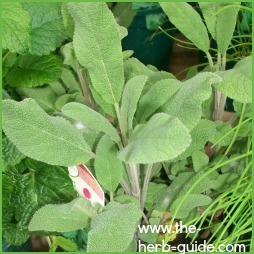 The sage plant is an absolute must for any herb garden. It is evergreen and highly aromatic and has many culinary, medicinal and cosmetic uses. 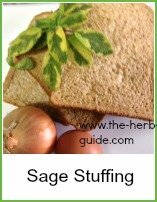 Instructions for growing sage can be found here. It is easy to grow from cuttings - merely take two or three shoots about 4 inches long and strip the lower third of leaves. Dip in hormone rooting powder and then into a small plant pot of compost. The cutting should strike within about 4 weeks. You can tell that they've taken, when you see tiny new leaves growing from the top of the shoot. 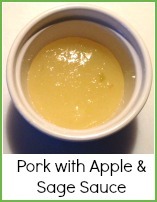 I use it in cooking, to make stuffings for turkey and chicken - you'll never buy a packet of stuffing mix again! 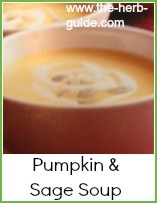 It's an ingredient in many natural cough medicines - it's my favorite herb for making cough medicine. It's an excellent gargle for sore throats. Make a steam bath out of some boiling water and a few sage leaves - use this as an inhalation or a facial. The steam bath can also be used to relieve the blocked nose of head colds and sinusitis. The only problem with sage is that it can sometimes die for no reason - established plants of four or five years old can just get sick and you lose your plant. A solution here is to take a few cuttings every year so that you have some in stock if that should happen. 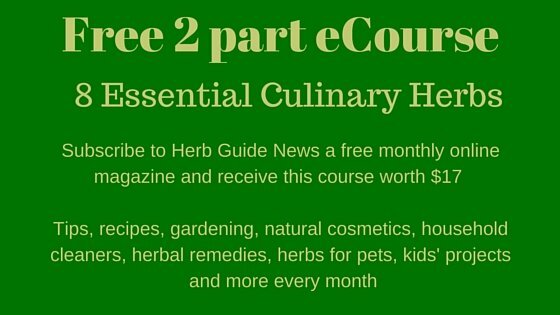 You can give your surplus away or sell them - read this section on Growing Herbs for Profit - it may be the start of a whole new way of life for you.